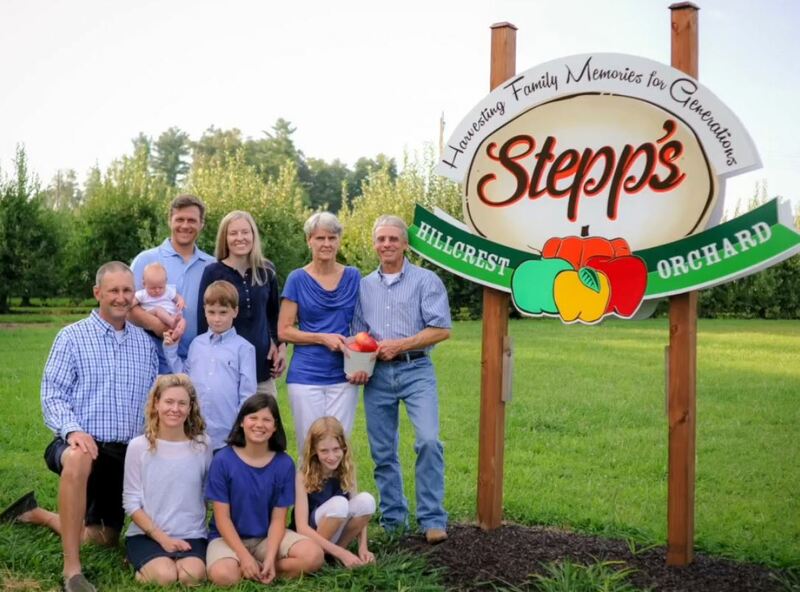 The J. H. Stepp family moved to the farm off Pace Road in January 1967, and J. H. (the family patriarch) gave it the name “Hillcrest Orchard.” The farm had been the home place of a distant cousin, Polk Hill, who was known to let visitors to the farm glean and pick up apples at the end of the season. Mama Mann, J.H.’s mother-in-law, continued the business and each year the number of people who showed up to pick their own apples grew. J.H.’s family had previously operated the J.H. Stepp and Sons Packing House, General Store, and Hardware Store in Dana. By 1972 J.H. was ready for a change, maybe a slower pace, and on trying “pick your own apples.” The first year J.H.’s wife, Yvonne, and Mama Mann worked out of a car until an 8′ x 8′ stand was built. By 1975 the current “apple house” was completed. The two sons, Joby and Mike, were working full time in the orchard and also taking care of 200 rented acres. Many apples were still taken to the packing house but the pick your own trade was growing. As time went by, the farm staff changed. The eldest son, Joby, married and moved to Virginia to farm and Mike, the youngest son took a job off the farm due to several years of low production from frost and freeze. With little or no fruit, the farm could not support all of the families. As time went by, Sonya, the oldest daughter, continued to help at the farm through the 2013 season. The business grew with a continued increase in people wanting to pick their own apples. Mike returned to the farm in 2003 and soon other changes were incorporated into the family business. School tours which began in September that year experienced much success and wagon rides were offered on weekends. Mike’s wife, Rita, retired from teaching in 2004 and became farm tour coordinator. The farm added Farmer Mike’s pick your own pumpkins allowing guests to stroll through rows of sprawling pumpkin vines to select the perfect one to take home. Any given day in the fall three generations of the Stepp family have been seen at the Apple House or in the orchard sharing with visitors the farm life they love. On June 19, 2008, JH’s wife, Yvonne, and matriarch of this family farm passed away and left a tremendous void in the hearts of her family and those who knew her. JH passed away peacefully on Sept. 4, 2011, at the age of 91. Trying to fill his amazing shoes has been a lofty goal of his family.